I can't be away from food for too long. I have a healthy, loving relationship with food - and be it not always kind to my waistline, I am far too good to it. I am a meat eater, vegetable lover, cake and bread baker, chicken fryer, shrimp griller, pan sauteer (is that even a word?) and more. Gosh, I do enjoy a good meal. Last night I made salmon with my new topping of choice - sauteed baby tomatoes and red onion with garlic. I let the mixture simmer in the pan till it starts to get soft, then add my salmon filets and douse them with lemon juice, more garlic and plenty of salt and pepper. The lid goes on and it's done in about 15 minutes. In that same time, I can steam asparagus and prepare the rice! Mmm, mmm, good. 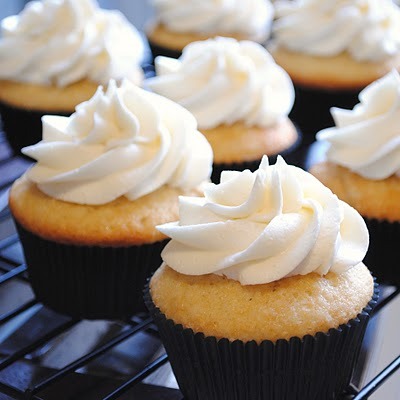 This morning I spotted these divine Champagne cupcakes on Homemade by Holman. Get the recipe here. 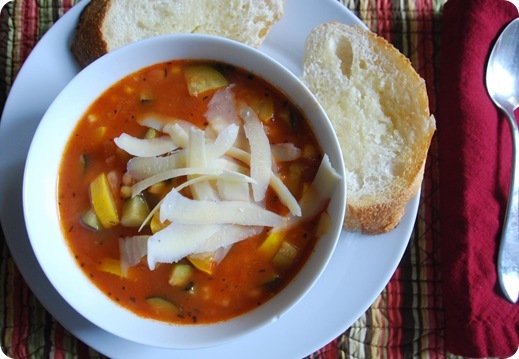 Then there's some heartwarming minestrone soup with a picture good enough to eat over on Centsational Girl's blog. That recipe is here, and I'm thinking about scouring the pantry to see if I've got enough ingredients to make my own version tonight. If I come close to having everything, I'd really rather not go to the store, so that's when things get interesting. I start mixing and matching ingredients and end up with a totally new recipe. Usually it's pretty tasty. But the husband candidly informs me when it's not. Ah, food. What's not to love? Sounds fabulous!! What SHALL we eat next week when YOU are in residence? ?